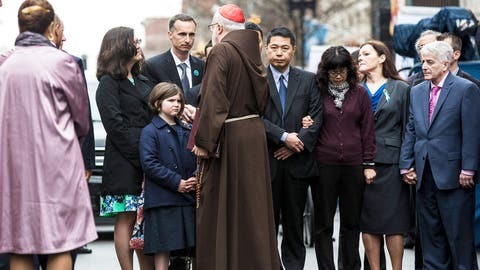 The family of Martin Richard, an 8-year-old boy killed by a bomb last year at the Boston marathon, meets with Cardinal Sean Patrick O'Malley during a wreath-laying ceremony on Tuesday's one-year anniversary of the marathon bombing in Boston. Survivors, first responders and relatives of those killed in the Boston Marathon bombing marked the anniversary Tuesday with tributes that combined sorrow over the loss of innocent victims with pride over the city’s resilience in the face of a terror attack. "You have become the face of America’s resolve," he said. In the evening, after the tributes were over and most people had left, police evacuated the area around the finish line to investigate two unattended backpacks and took a man into custody. They said the bomb squad detonated the backpacks as a precaution, but there was no immediate word on what was in them. In Washington, President Barack Obama observed the anniversary of last year’s deadly marathon attack with a private moment of silence at the White House. Obama said this year’s race, scheduled for April 21, will "show the world the meaning of Boston Strong as a city chooses to run again." At the tribute, several survivors of the bombing alluded to their injuries but focused on the strength they’ve drawn from fellow survivors, first responders, doctors, nurses and strangers who have offered them support. Downes described Boston Strong, the slogan coined after the attack, as a movement that symbolizes the city’s determination to recover. He called the people who died "our guardian angels." Adrianne Haslet-Davis, a ballroom dancer who lost her left leg below the knee and has recently returned to performing on a prosthetic leg, said she’s learned over the last year that no milestone is too small to celebrate, including walking into a non-handicapped bathroom stall for the first time and "doing a happy dance." Earlier in the day, a wreath-laying ceremony drew the families of the three people killed last year — Martin Richard, Krystle Campbell and Lu Lingzi — and Collier’s relatives.